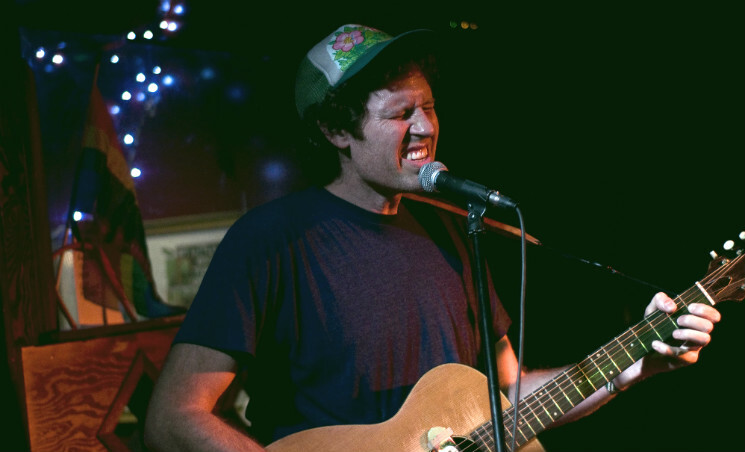 Reclusive Calgary mainstay Chad VanGaalen debuted his new backing band, the Bleach Wipes, at Broken City last night (September 10), consisting of Lab Coast's Chris Dadge on the drums and Ryan Bourne on bass. Victoria, BC shoegazers the Backhomes were the first opener of the night. The venue slowly filled during the lengthy period between doors and the Backhomes. Distorting their guitars and vocals, the duo's sound proved repetitive but alluring in its ability to hypnotize. This was accentuated by the wavering, multi-coloured light projected onto a drum bearing the band's name, which bled into various cyclical animations, such as pink horses galloping. Following the Backhomes were Lab Coast, who brought the energy in the room up, their swift, melodic pop songs creating a varied set that became more engaging as they kept playing. The band's guitarists engaged in skilful interplay, which created a rich bed of sound. The sold-out room was full by the time Chad VanGaalen and the Bleach Wipes took the stage. The aggression with which VanGaalen pounded his acoustic guitar throughout much of the set was powerful and provided robust juxtaposition to Bourne's distorted bass and Dadge's crisp percussion. Performing a range of songs from his latest album, Shrink Dust, as well as previous records, VanGaalen displayed the breadth of his ability. Highlights of the set included a chilling rendition of "Cut Off My Hands," the singalong "City of Electric Light" and the lovely "Sara," which VanGaalen dedicated to his wife. The contrast between songs in a folk vein versus the experimental rock supported by the Bleach Wipes made for a dynamic performance. Chad and his band also managed to improvise a song about body odour following an audience request, and VanGaalen elicited some groans from the audience after going a little too far in describing what he suggested were the fantasies of an enthusiastic fan. The night had all the makings of a typical VanGaalen show: humour, conviction, clear, honest vocals. However, the addition of the Bleach Wipes added something critical to the mix: a reinvigoration of VanGaalen's sound.